This Ubin Day, come visit our booth on Pulau Ubin. Here’s a sneak peak of what you can expect, learning about herps (aka reptiles) from our guides and volunteers. There will also be colouring activities for children! Mark your calendars and join us on that day! There will also be other booths and events to attend. To find out more, click here. Participants at our previous Herp Walk @ Dairy Farm in December 2015! WE’RE BACK! We took a break in April, but we’re excited for the next installment of our Herp Walk! In an effort to promote an awareness of Singapore’s natural and historical heritage, and to promote conversations amongst Singaporeans, the HSS has begun the Herp Walk @ Dairy Farm Nature Park. We want to raise awareness, in particular, about Herps! These misunderstood creatures are often thought of as scary or unnecessary. 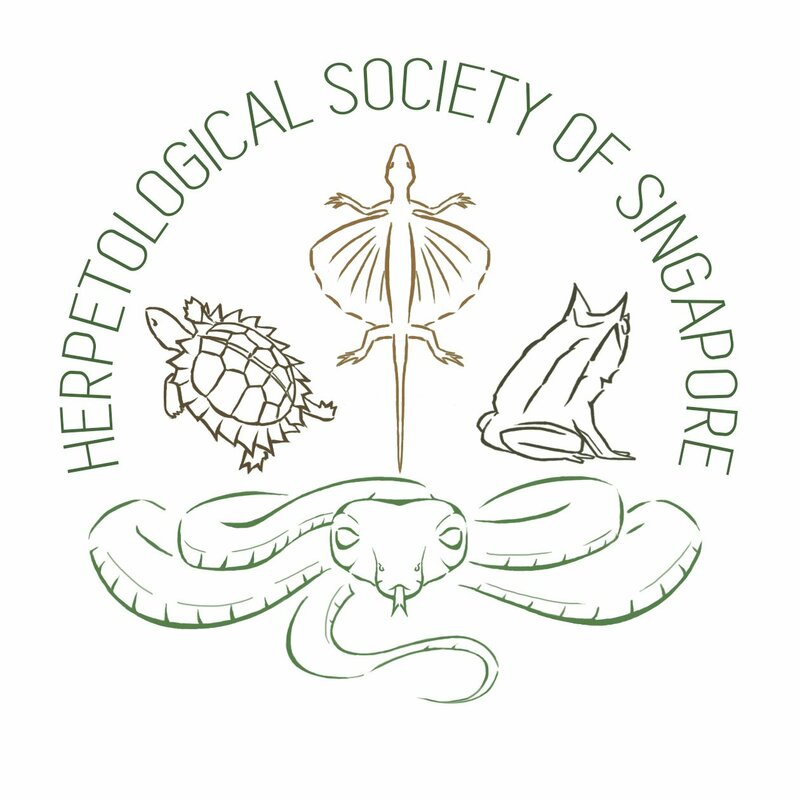 But we want to show Singaporeans that Herps are important and integral to the Singaporean ecosystem! You can read about our previous Herp Walk @ Dairy Farm at this link! This is Part 3, of the four-part series of posts, we discuss the various South-East Asian herps that are capable of gliding or parachuting. Click here for Part 1 and here for Part 2! The genus Draco belongs to a family of lizards called Agamidae (commonly referred to as “Dragon Lizards”). There are over 40 species within this genus, three of which can be found in Singapore. They are the Sumatran Flying Dragon (D. sumatranus), the Black-bearded Flying Dragon (D. melanopogon) and the Five-banded Flying Dragon (D. quinquefasciatus). On many of our Herp Walks, we see at least one species of Draco and it is always a crowd-pleaser. Often, they simply resemble twigs that stick out of the side of tall trees and it takes a while before everybody is able to spot them. They have been observed eating ants and flashing their colourful dewlaps. If we’re lucky we even get to see their impressive aerial displays as they swoop from branch to branch. For such arboreal creatures, gliding is an incredibly energy efficient way to maneuver through their 3-dimensional space. It can help to escape from predators and even to establish territory. This clip from the Animal Planet series, Fooled by Nature, we can see how the Draco takes to the skies. There are several important morphological adaptations that the Draco has that make it such a good glider! The most important one, is the patagium. As is the case with many gliding animals, a flap of skin that serves as a giding membrane that increases the surface area of the lizard. This patagium is unique in the sense that it is actively controlled by ribs and muscles on the lizard’s thorax. As such, the patagium is able to be extended, folded away at will and even adjusted while in flight! Compare this to the largely passive patagia of the Gliding Geckos, and it is clear why the Draco is often seen as a more agile glider. It is interesting to note that while most lizards use their intercostal muscles (muscles running between the ribs) to breathe, the Draco actually uses its pectoral, or chest muscles to aid breathing! This is a truly fascinating potential example of exaptation, the evolutionary repurposing of traits. Another, often observed morphological feature of the Draco is its colourful dewlap. The males have a large flap of skin that can be extended for mating/territorial displays (Yes! The lizards are sexually dimorphic!). This “flagging” behaviour is coupled with head bobbing and “push ups”. These dewlaps, and their accompanying lateral lappets are thought to possibly act to stabilize the lizard in the air. Theoretical analyses of the Draco‘s body shape and structure have suggested that the shape of the hind limbs also aid in creating lift. What about size? Research was done on Draco species that encompassed the full size range of the genus. It looked at how gliding ability and angle varied with the size of the lizard. The researchers found that smaller species of gliding lizards were able to glide at smaller angles and and over a wider range of angles than larger species. Doubtless, the Draco is well adapted to exploiting its 3-dimensional space. There are potential applications in biomimetics and robotics that have not been fully explored! Once again, the importance of preserving these organisms that can potentially provide the blueprints for engineering breakthroughs cannot be understated. Furthermore, much like any other organism, they are important parts of their ecosystems and their loss will certainly be felt. – John KO. (1970b). Studies on the histophysiology of the muscles of the South Indian flying lizard, Draco dussumieri (Dum. & Bib.). J Anim Morphol Physiol 17:44–55.